You are here: Home / Blog / Musing: Is the Future of Data Centres Small and Distributed ? Musing: Is the Future of Data Centres Small and Distributed ? One of the outcomes of Microsoft building it’s own Data Centres is that it could easily turn that into a product. Or Rackspace, Joyent or any of the other cloud providers. You don’t buy computers or storage in little pieces, you buy racks of cloud resource and apply a software layer to allocate resources. Companies like Scale Computing and Nutanix are already doing this on a smaller scale – buy a bunch of chassis and the entire compute and storage pools scales out automatically. You don’t actually need storage arrays or server farms. Computer hardware is continuously improving in efficiency and performance. It’s possible, if not probable, that servers are getting better as a faster rate than software can waste that improvement on code bloat. If that is true, servers can use less resources to provide services. Storage is also getting smaller. That is, data centres will get smaller over time. Today, it’s more efficient to gather servers into large clusters and draw massively on the power and telecommunications grid. This attachments at vital points reflects the nature of power grids and telecommunication networks. Power is generated in at critical network points by nuclear and coal power plants and data centres attached to get enough power. Telecommunications is centralised into key distribution centres or Internet Exchange Points to get access to enough bandwidth. Tomorrows power networks will rely on distributed power from alternative systems like solar, gas, wind etc. Having large clusters of servers will be inefficient as large power stations are shutdown. It’s always more efficient in the network to locate compute close to users. Logically, data should located near to users, preferably at the end of the street or in the same town. This creates a more efficient edge network by distributing data to the edge. Today networks are moving to a “fat centre” model after a decade of thin edge networking. Consider that todays cloud providers would have the hardware and expertise to build mini-DCs. They would also have the software expertise to cluster services across hundreds of data centers. I wonder. Because Im pretty sure it would look like this in a post cloud era ? And by post cloud, I mean still using external compute and storage, but just distributed. Computing is becoming a utility, much like power and water. What you say completely makes sense and conceive Micrsoft, RackSpace, etc as tomorrow’s computing service providers. Storage has already become that way, thanks to Dropbox, Google Drive, etc. Its interesting to look at it from the perspective of power grid and the evolution. 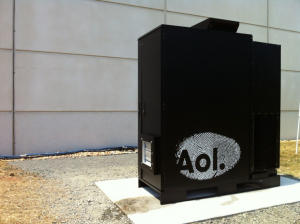 AOL’s uDC has some pretty specific use cases and some pretty stringent NO use cases. I had to create the NO use cases because of folks wanting to use them in ways that would cost WAY too much money for the networking between the units themselves or even back to a primary large facility. For the target uses though, they aren’t a lot more expensive than a traditional facility and have resiliency advantages, performance advantages, legal and tax advantages in some localities. Good post!